Warren’s legislation has excellent components, including the creation of a Federal charter for corporations which could be revoked if the corporation serially engages in illegal conduct. One fatal flaw in Warren’s plan is that the charter could only be revoked upon application by a State Attorney General. If the corporation is a large employer in the state, that pretty much means the State Attorney General is going to do nothing to put it out of business. One only needs to look at the long-running crime spree at Citigroup and JPMorgan Chase to know we’re correct in that assessment. Against this backdrop comes a new book – Citizen Capitalism: How a Universal Fund Can Provide Income and Influence to All. One of the authors is the legendary Wall Street legal scholar, Lynn Stout, who sadly passed away in April of last year. The two other co-authors are Tamara Belinfanti, a professor at New York Law School who co-founded with Stout in 2015 The Ethical Shareholder Initiative, a nonprofit focused on creating more sustainable capital markets; and Sergio Gramitto, an Assistant Law Professor at Cornell Law School. We remember Lynn Stout as one of the first to blow the whistle on the rigged IPO market of the 1990s – which led to the epic dot.com bubble and bust of 2000. In 1994, BusinessWeek published an article, “Beware the IPO Market,” which quoted Stout, then a professor of securities regulation at Georgetown University Law Center. Stout stated: “The IPO market is rigged. It’s rigged against the average investor.” Stout went on to explain that the penalty bid was “devised by a group of top Wall Street firms during Securities Industry Association meetings in the 1980s.” Effectively what was going on, says Stout, is that Wall Street’s large, lucrative institutional clients are allowed to cash out when the stock price soars while the little guys are left “holding the bag” and serving as a prop under the price of the shares. This benign-sounding phrase, “penalty bid,” was effectively one of the greatest wealth transfer mechanisms ever created by Wall Street. It ended with $4 trillion in losses to the suckers left holding the bag. 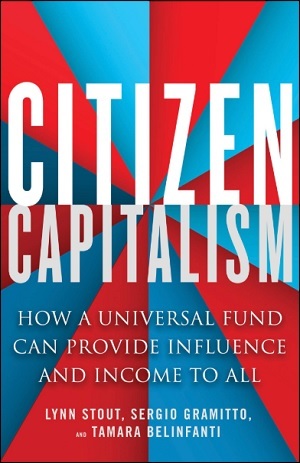 The key idea behind the new book, Citizen Capitalism, is the following: The creation of a Universal Fund, which would be similar to a mutual fund with a few key differences. Each U.S. citizen, age 18 or older, would receive one share in the fund. The fund would acquire a portfolio of stocks in different corporations through donations from the corporations and wealthy individuals. The citizens would receive the cash from the dividends throughout their lifetime but would not be able to sell or trade their shares. When the citizen dies, their share would return to the fund. The Universal Fund would not be allowed to trade its shares so it would have no interest in seeking short-term profits. The Universal Fund would use a nonprofit proxy advisor to vote its shares, reflecting the will of its citizen shareholders. Our quibble is this: corporations are buying back their stock for the very purpose of retiring it from public trading in order to artificially inflate their profits per share. If the stock is not retired, but instead handed over to the Universal Fund, it is still a publicly traded share that is entitled to a share of profits and dividends. CEOs and top corporate management are awarded their obscene bonuses and stock options based on how they grow the corporation’s profits. That provides a hefty incentive to buy back stock, retire it, and inflate profits to line their own pockets. In addition, the best game in town is for the buybacks to be made in the Dark Pools of the big Wall Street banks. That’s a nifty device to prop up the share prices when negative news brings on a wave of selling. Then there is the problem of the Universal Fund misconstruing how the payment of dividends to its shareholders would improve the current situation. One example cited in the book is that after the Fund reached a $3 trillion portfolio value, it would begin distributing its dividends which could, potentially, generate $300 of income to each citizen who registered to be a shareholder. The problem with all of these simple-fix ideas for repairing American capitalism is that they focus on treating the symptoms rather than the disease. The disease is a corrupt Federal campaign finance system that allows the lawyers for the one percent to take over the presidential transition team and put puppets for the corporations (owned by the one percent) in the key spots in the cabinet, Wall Street regulatory agencies and the U.S. Justice Department. Sound Federal legislation and anti-trust enforcement also isn’t happening because the campaign financing system is putting compromised men and women in Congress. Time is running out for the country to get its capitalist house in order before Wall Street, the epicenter of the rot and corruption, brings on another epic financial collapse.